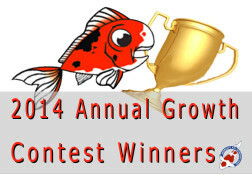 On Saturday May 3, 2014 Andrew’s Koi held its Annual Koi Growth Contest. The winners are listed below. Both koi variety and owner are listed.